I used to hate cooking a lot more than I do now, and this was one of the recipes that convinced me I could do it. It's about the easiest thing you can imagine and you don't even need to use the oven (you can, but it's not so slick). I stole this from a former Ruth Chris' Chef that craved the flavor at home... You're going to need a cast iron skillet for this one though, the high heat will burn the Teflon off non-stick pans. 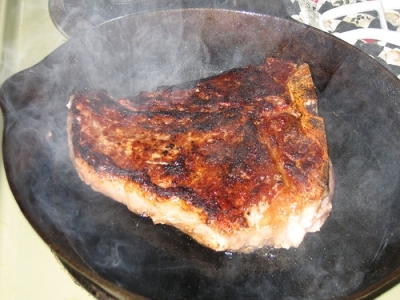 If you have it, a cast iron skillet with raised grease ridges would be perfect. Another easy, always tasty side dish for a hearty meal. 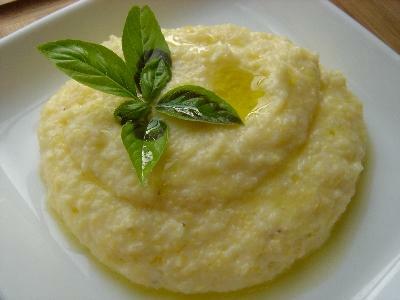 By cooking the polenta in the oven, you save having to sit there and stir it forever, AND it comes out smooth and creamy from the even cooking. Hi, Mario. I send a message to you... Have you seen it? Rachel in Beijing, China. oh yeah, you should add you palenta recipe too!